Two friends, fighting their way home . . .
SHANTI and her calf TARA are beautiful circus elephants. HARVEY is the faithful old collie who leads the show. In war they will perform their most death-defying trick yet. When the First World War seizes Europe, Cullen’s Circus is forced to close. The men are sent to fight and the animals are torn apart from their keepers, and each other. But while Shanti must help on a farm, it’s little Tara who faces a far worse fate. . . Separated too soon from her mother, Tara’s life is in danger. Only old, brave Harvey can bring them back together. 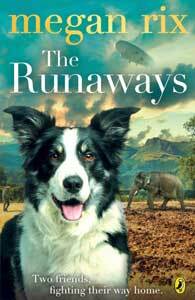 And so side-by-side, dog and elephant set out on an extraordinary journey across the English countryside – but can the unlikely friends find Shanti in time?